Great to meet you in Abbotsford and thanks for the plugs on your blog. A couple of minor corrections: I was SB 9 (one of the solos) in 1980-1981 and commanded the Snowbirds as SB1 in 1989-1990. The name of my book is "A Tradition of Excellence - Canada's Airshow Team Heritage" and it can be ordered via my address above or online at www.CanadasAirshowHeritage.com. Thanks too for the T-shirts Randy. They are excellent. The Discovery Air "Hawk One"
SPEEDWEEK 2011 is over but not life! Well Speedweek is over and the results are posted on the SCTA-BNI website (you can use the Link on this blog). I have been following the progress on line and dismissing all the reminders that my computer was programmed to alert me to this year, from loading day to packing up yesterday. 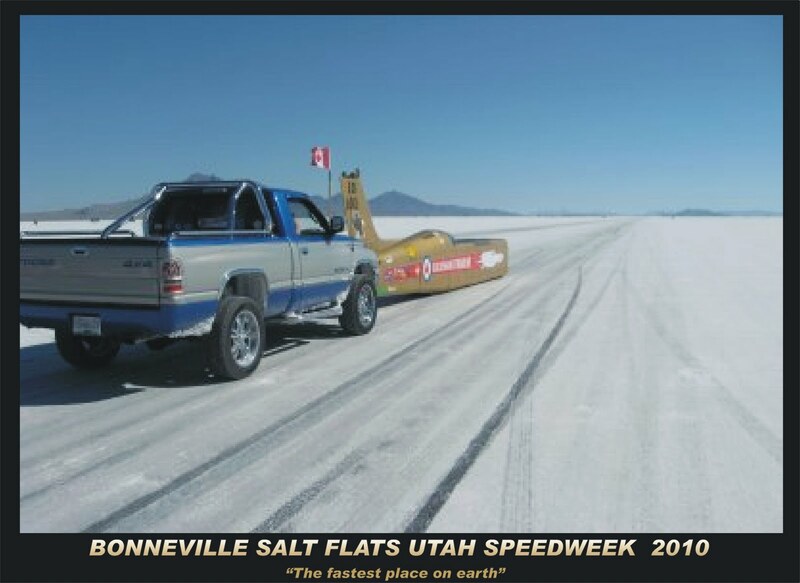 We would be heading home today and be tired / broke and discussing all the things that transpire in the 10 days adventure of Bonneville that satisfies our Salt Fever. If you have not witnessed the awesome sunrises, the clear blue sky, the roar of mighty engines , the scream of a wide open entry at the 4 mile mark pushing 400mph or the sunsets, the wonderful camaraderie of the competitors, crew, staff and fans, you must attend. Do it next year! Don't wait, for your bucket list will be buried with your other good intentions! Live this time not the some time. ﻿﻿Amber is my niece from Calgary. She took up running about a year or so ago to keep fit and has got hooked on the sport. She works in a banking office so the opportunity to keep fit must be created. Good luck Amber! 3rd 5K down!!! This was the best race EVER!! It was a lot of fun, and running at night is a whole new experience. Can't wait to do this one again, hopefully it comes back to Calgary next year!! Colt Cams the leader of diesel technology! Geoff Bardal owner and camshaft expert is excited about the advancement he has made in cam design even in the two years since Piers Harry built the first Cummins 3.91 bt for the Goldenhawk. It's hard to believe it could get better! Colt Cams is on board to grind up that new cam profile for next upgrade of our engines. But you don't have to wait, you can order yours now 4 or 6 cylinder 12 or 24 valve technology by following the link on this blog or calling 604-856-3571 and speak to the man directly! Ilona Bardal (Geoff's partner) and Mya the guard dog/pet pose in entrance to the new spacious Colt Cams machine shop. Maya looks like she wants to know why she didn't get a Goldenhawk team shirt. "Well Mya we will consider four arm holes in the next batch." She was explaining the cut away of the Cummins and telling me about a photo shoot for a magazine, they were invited to attend (and be published in article) in Oregon. The article will feature Colt Cams as the best horsepower choice for your Cummins, 12 or 24 valve engine. Now dat's a NOSE JOB! I hope one day the new upgraded Goldenhawk will have this shape of nose. Kevin has most of it drawn now just need time and talent to build it. Dan is the most sought after Man at airshow! I meet Chris Adams to discuss photo procedure that brought back a lot of memories of my youth as RCAF photographer in Saskatoon. It is always a thrill to sit in my favorite aircraft and always have to curb a little jealousy for the guys who fly the F-86 Sabre Jets. OK I am ready, crank it up!! The pilot of the HAWK ONE, Dan Dempsey got his honorary GOLDENHAWK RACING TEAM status and shirt. FYI, also Dan was once team leader, pilot of a SNOWBIRD #9 (one of the solos ) and commanded the Snowbirds as SB1 in 1989-1990. After leaving the air force he has been flying passenger jets out of the far east. Dan & Randy discuss the Bonneville experience and are joined by team photographer Peter Handley. I wonder if I could get my old job back?? Not too likely. Dan is here with "Smoky 2' He was the man responsible for making the red white and blue smoke made famous by the RCAF GOLDEN HAWKS. Smoky2's wife was with him and she was a Fighter operations person in the RCAF also. Smoky is telling Kevin how to make smoke for the streamliner and has promised to send us the formula and ingredients list. Thanks! Chris for the help to place the stairs and move them for the pictures. AME Chris Adams was on hand to meet us for the photo op. But first he had to upgrade his attire . Kevin trying not to grin! "Wave Kevin, wave to the camera"
You just have to love the smile on his face. Richmond BC driver Mr.Ball (?) owner of South Arm Excavating was very strong contender with a couple of John Deere machines. I couldn't resist the temptation to attend the Classic Tractor Pullers meet in Cloverdale on Saturday. I was not disappointed as I watched many of the old tractors that I had grown up operating for the farmers in Saskatchewan. This 830 John Deere brings back many memories. They were very robust and could pull a very big load without ever stopping except for fuel and the driver to pee. Check out the tail light. Do you recognize it? Then you may be old. Frank from Strutwise, (Kevin's neighbour and a sponsor of ours as well as a Truimph landspeed racer), and I are discussing a new system to open the automatically canopy with the release of the latch. This will improve safety and make escape from the car quicker. More to come as we progress. Check out the shirts! it is an honour to have Jack wear it! ﻿ Jack is pressing the 80 year marker on his race through life and is still going strong. preparing to open Museum in Aldergrove. He has a myriad of toys and is going to make a nice place to host his many friends and his old favorites. Among his collection is an original Hemi 'Cuda, sprint cars and several front engine dragsters. Jack gave me my Christmas card, it is a photo of his oval track sprint car in his living room in Burnaby. When you drive into Aldergrove watch on the north side of the Fraser highway and you will see the cars in the show room. Drop in and say hello. I am sure you will find him working on something special like I did. He was assembling a very clean flat head Ford. Great to see a legend in his own time! Good luck and good heath Jack. New(est) Landing Gear is complete!!!! Would you believe that I actually did the final work on the build of the gear? I had to open up the centers of the wheels so they would fit over the Dodge hubs. It took a couple of hours with the high speed grinder and Harvey kept me company. He was likely amazed to see me actually work. As you can see Harvey Dyck is preparing the last of the parts to make the tow rig for the tandem (fits under front of car which is towed backwards) landing gear. This tow rig when not in use under the car will attach to the front (steering) gear and form a trailer configuration allowing it to be towed to wheresoever it is needed. Hopefully not to pick up the wreckage! A special thanks to Harvey and Kevin for building the needed equipment.